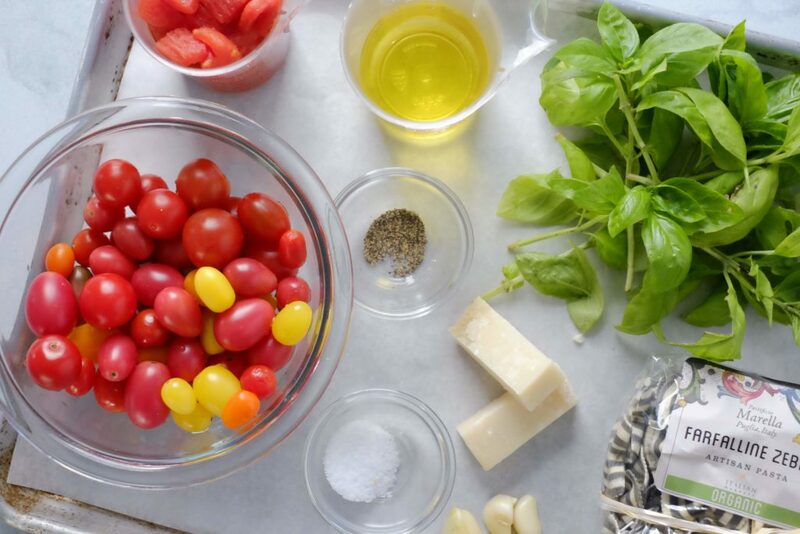 Simple Cherry Tomato and Basil Sauce takes only 20 minutes to make. Toss it over a graphic specialty pasta to create a next level dish. 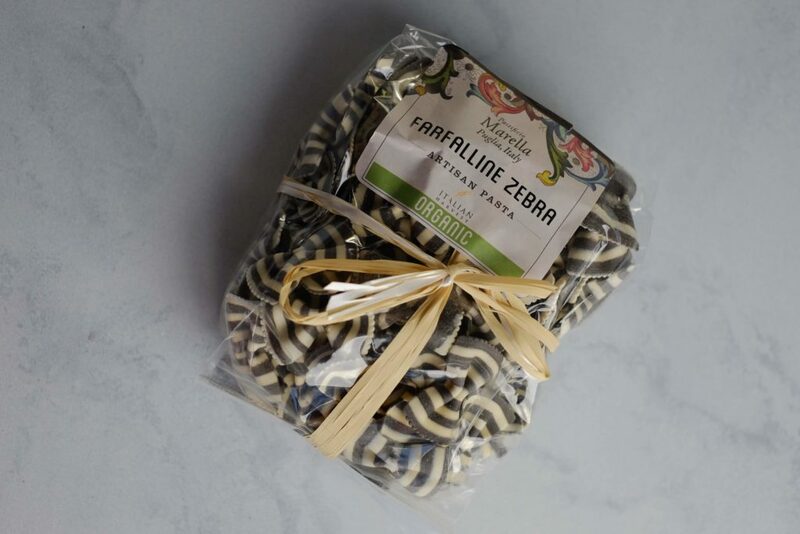 I don’t eat pasta that often, but when I spied this Farfalline Zebra pasta in a Los Angeles specialty market I had to buy it. 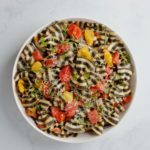 How could I resist pasta that looks like Beetlejuice’s black and white suit? 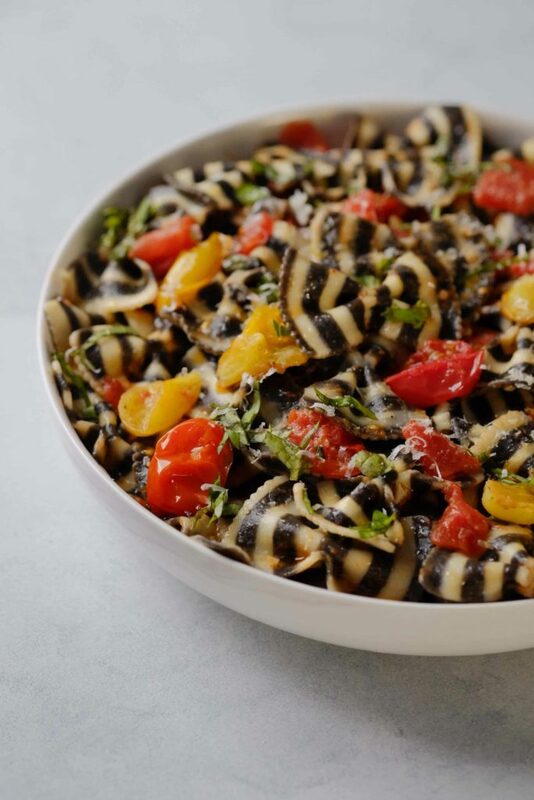 Pasta that's perfectly matched for a Halloween dinner. 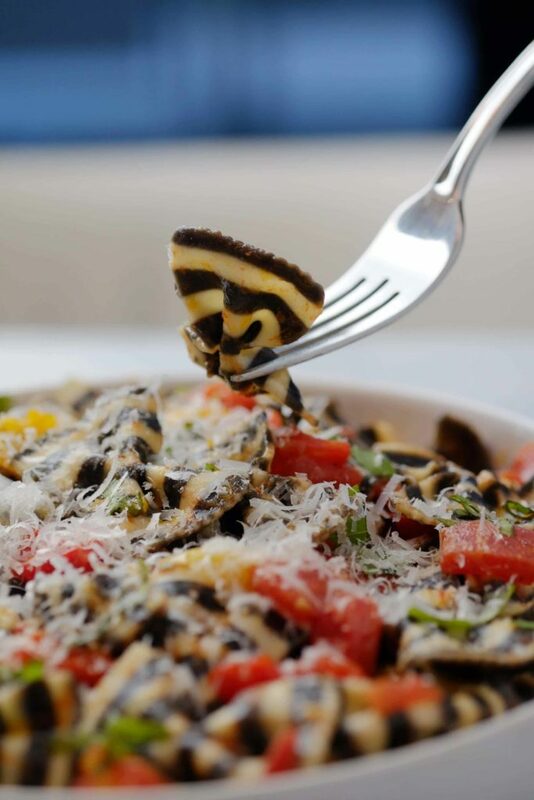 The Farfalline Zebra pasta is from Puglia, Italy. Its organic and made with dehydrated squid ink. A graphic pasta like this requires a simple, unfussy sauce. You want to see the stripes. This pasta sauce is one of my favorite recipes that you can make year round. Bring a large pot of salted water to a boil and add pasta. The water should be salty like sea water. Stir pasta occasionally while cooking. Drain pasta and transfer to a large serving bowl. Start cooking the sauce while the pasta is boiling. 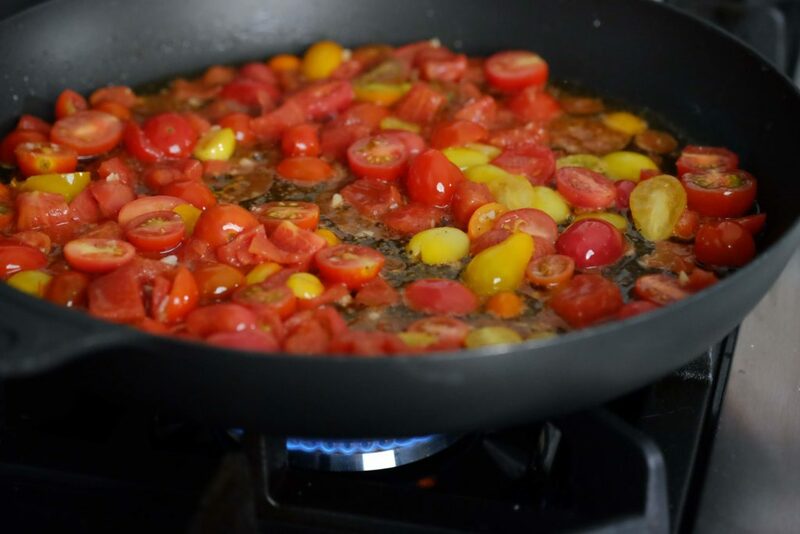 In a large skillet over medium heat with olive oil, cook the garlic, cherry tomatoes, diced tomatoes, salt, and pepper. Gently stir the ingredients. The cherry tomatoes will burst while cooking and create a sauce. Add the sauce to the pasta and toss well. Top the pasta with basil and freshly grated Parmesan. In a large pot of salted boiling water add pasta and cook until al dente. Stir pasta occasionally while cooking. Drain pasta and transfer to a large serving bowl. While the pasta is cooking, heat oil in a large skillet over medium heat. Add garlic, cherry tomatoes, diced tomatoes, 1/2 teaspoon of salt and 1/4 teaspoon of pepper. Gently stir the ingredients. As the cherry tomatoes warm up, they will begin to burst. Cook for 8 - 10 minutes occasionally stirring the sauce. Add the sauce to the pasta and toss well. Top the pasta with basil and freshly grated Parmesan. Serve immediately. I used Farfalline Zebra Artisan pasta which can be found online and in specialty food markets. Let me know if you made this recipe. Snap a pic and post it to Instagram. Tag @lisamarietodd and hashtag #anappetizinglife.